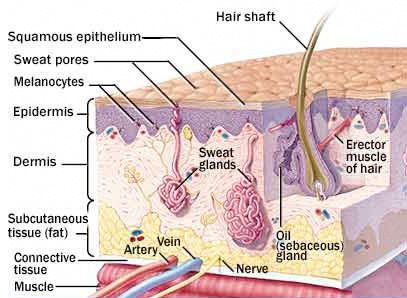 The skin is the largest organ in the human body in surface area and weight, and it has six main functions. The skin functions as our first line of defense against toxins, radiation and harmful pollutants. Skin contains cells that provide immune functions to protect against infections. Our skin has the ability to identify and destroy foreign substances that may potentially be harmful to the body. Thousands of pores on the surface of the skin can absorb vitamins, acids, water, and oxygen in order to provide moisture and nourishment to our skin. The skin secretes sebum, a mixture of oils that keeps the skin soft and supple. The layer of sebum on the outermost layer of the skin is known as the acid mantle. When intact the acid mantle has a pH that ranges from 4.5 - 5.5. The acid mantle is acidic in nature to protect the skin from outside invasion of microbes. The skin regulates the body’s temperature by sweating; when water from sweat on the skin evaporates it gives off heat and cools the body. The body’s temperature increases or by shivering or getting a piloerection a.k.a. goosebumps when the body is cold. The contraction of muscles releases energy that warms the body. The skin contains millions of nerve endings that transport stimuli. These nerve endings allow humans to detect sensation such as heat, cold, pain and pressure. As you just learned, your skin health is important not only for your appearance, but more importantly your skin performs many essential tasks for your body. The take home, take care of your body, inside and out.